In accordance with the State Constitution, the legislative session always begins on the second Monday in January, and we meet for 40 days. The days of the session are not consecutive, so the ending date (sine die) varies, and will be announced sometime in the next month or so. The session usually ends in late March. My office is in Suite 511 of the Coverdell Legislative Office Building, 134 Capitol Square, Atlanta, 30334, across the street from the Capitol. You are welcome to drop in at any time. My chief of staff continues to be Ann Abramowitz, whose full-time job is as a psychology professor at Emory University. My legislative aide this year is Robert Johnson, a student at Georgia Tech. My Administrative Assistant is JC Bryant. She can be reached at jc.bryant [at] house [dot] ga [dot] gov or (404) 656-6372. If you want to call and leave a message, you can use this number to do so. Students between the ages of 12 and 18 can serve as a page for a day during the session. The paging program is explained here. To page for me, arrangements will be made by JC Bryant (see above). You are welcome to participate in the legislative session. You can attend committee meetings, observe floor sessions from each chamber's gallery, and watch the floor sessions as well as some committee meetings online. Here is a link for the House video broadcasts (to include archived videos). If you visit the Capitol, be sure to bring your photo identification. There are metal detectors for both the Capitol and the Coverdell Legislative Office Building. You can park at the Pete Hackney Parking Deck, 162 Jesse Hill Drive SE, or Underground Deck A, 75 MLK Dr. SW. Also, the Georgia State MARTA station is across the street from the Capitol. If you attend committee meetings, you can enter and leave as you please. It is perfectly acceptable to walk in after meetings start. If you want to speak on a bill, then you will want to arrive a little before the meeting begins so you can sign the list to speak. You can track legislation online here. If you know the bill or resolution number, you can type it into the search function and it will pull up the bill. The text of bills often changes as they go through the committee process and as each chamber considers the legislation. If you need help with this function, Ann and Robert can assist you. If you email or call your legislators at their Capitol Offices, be sure to include your residential address. 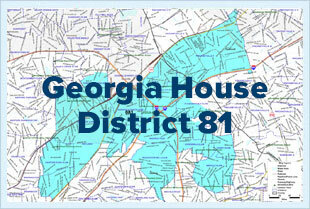 As you know, I represent House District 81. Your address is the only way my staff and I can tell if I represent you, or if someone else does. If someone else represents you, my office will put you in touch with your Representative. We can only do this if you include your address. If you're not sure who represents you, you can check here. If you support or oppose legislation, you are best served by contacting your state representative and state senator. As noted above, if you use email, be sure to include your mailing address (just as you would on a traditional letter). This helps to identify you as a constituent. It is best to include the bill or resolution number (if you know it). Some people copy their emails to every member of the General Assembly without including their mailing address. This is not a very effective way to advocate for an issue because the recipients of the email do not know if they represent the sender. You may be surprised to know that my office's budget for the entire year is $7,000. We have a small staff and limited resources. But we work hard and try to be as responsive as possible. If you want a response but don't receive one (or don't receive one as soon as you'd like), please write us back and let us know. Some days we receive hundreds of emails and it takes time to read them and to respond. The best ways to reach me during session are email: scott [at] repscottholcomb [dot] com or office phone: (404) 656-6372. You can also email Ann at ann [at] repscottholcomb [dot] com and Robert at robert [at] repscottholcomb [dot] com. Ann and Robert can also assist you in making an appointment with me.